I’m passionate about sharing my love for quilting with others. 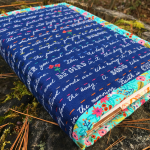 Whether you’ve never sewn before and are just embarking on your quest to learn how to quilt, or you’re an experienced quilter wanting to grow your skill base, I hope you’ll join me in these interactive video classes! 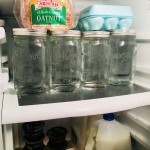 They never expire, and feature lots of helpful tools like the ability to pause, bookmark, ask questions, and even post photos. What are you waiting for? 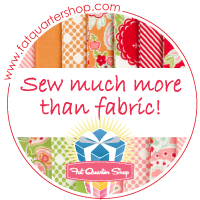 Let’s get quilting! 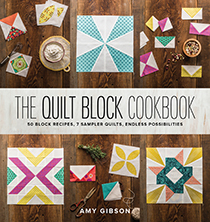 Get 50% off one class with purchase of The Quilt Block Cookbook from my online shop! Amy is doing her own Sugar Block of the Month in 2013. You pay $7.95 and then for 12 months starting in January 2013 you will receive an email with a pattern and instructions for a block. Plus you will receive a sweets recipe. 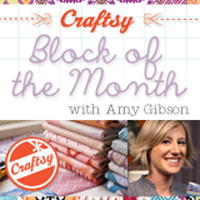 Craftsy is having another Block of the Month in 2013 with a different instructor. It will also be free like the 2012 Block of the Month. Amy did an amazing job as well as having two extremely adorable newborns and not to mention her girls! I know we are going to miss Amy as our BOM instructor but her new club is going to be fun. Just no videos. Is the $7.95 fee for the year, or is it monthly? Hello Amy, You inspire me. I have been doing the free BOM over the last year on and off, will finish the quilt over Christmas. Thank you so much for sharing all your wonderful ideas with us. I just discovered your Craftsy BOM Class this weekend and did a marathon session watching all the lessons. Hopefully after the Holidays, I’ll be able to start working on my blocks. I’ve already learned so much from watching the videos and know I will be a better quilter for it. Thanks! I have enjoyed this series. It has give me new ideas and different procedures in quilt making. I enjoy these modern ways for making quilt blocks. It is so fun! 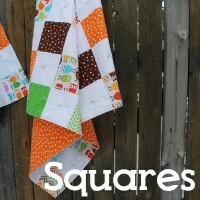 Not only for “newbies” also for advanced quilters like me! Hi Amy. Just started the quilt of the month club last night for 2012, hope to have it completed by the end the the year! Loving it! 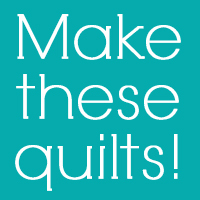 Your instructions are so clear…..Intend to be ready to be ready for the 2013 quilt of the month club. Also downloaded the pattern for the cathedral window baby mat and intend to do it. I always did the cathedral window the old fashion way , so this will be a new one for me . 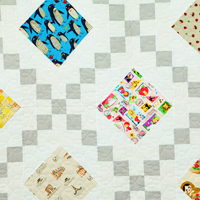 Sign me up for the free 2013 Craftsy block of the month. 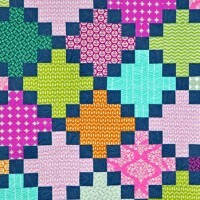 Please sign me up the the 2013 free craftsy block of the month. Will the 2013 BOM with the new instructed have video? I’ve come to quilting late in life. My 3 children are now grown and gone. About 20 years ago, I attempted to learn to quilt but was met with some disdain @ the local quilt shop. Not having any other resource, I never returned. 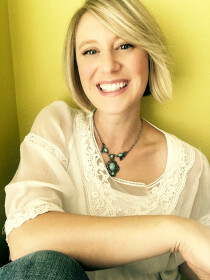 Enter Amy Gibson and Craftsy!!! Even though 2012 was a year of great transition…having an Estate sale, divesting ourselves of 23 years of raising children in our home, leaving my sister behind(she lived 5 doors down from us) moving 3 times, building a condo and moving out of town. Undaunted, I entered the BOM 2012 determined to learn. May I happily report that I am in the finishing stages of finishing my first ever beautiful quilt, thanks to you. I’ll post pictures on Craftsy. By touching our lives in your splendid, encouraging, teaching fashion, you now allow us to take that same skill and touch so many others with the same warmth and tenderness. May you be continually blessed for your patient kindness to an old woman eager to learn new things. Oh and BTW, don’t let the negative ninnies that were crabbing at you get you down. May my little tale mitigate their barbs. i join the sugar block club now how do i get to the patterns? Funny story, I am home today with my 5 1/2 year old son bc he is sick, and I was watching the conclusion of Modern Butter cream. My son says to me “Mom, I know. Remember Amy Gibson. She’s Craftsy Block of the Month. We can go back and watch her again and start all over! I said, “Yes, we can.” I LOVE that bc of you, my son is VERY interested in and enjoys quilting with me. You are inspiring old and new generations. Hmmmm Now, if we can just get the manufacturers to make sewing starter kits that AREN’T PINK! 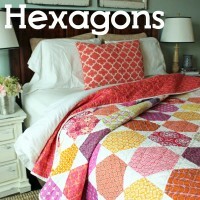 Thought you would enjoy :) Happy quilters here! I just redecorated my sewing room and am behind on my sugar blocks. I am trying to find the december lesson mentioned in the February North Star Directions. Can any one help? thanks! Hi Amy really missing you on craftsy! Just finished my 2012 bom quilt less a few blocks! I am really pleased with it sitting on the sofa in the garden room! Is it straight no! 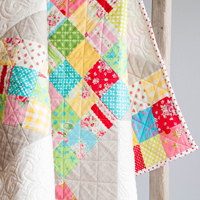 Is the quilting perfect no! But I love the colors and the fabric and I made it myself on a small sewing machine with no added quilting feet! Thank you for your inspiration. Good for you Judith! I struggle with the actual quilting. Love making the blocks. Amy, I am enjoying your QBOTM 2012 and just finished the August double star. In the video you stated using the cut off corners and making tiny half squares and that you had suggestions for using them on your blog. I can’t find them. Have you taken the suggestions off? or where do I look on how to use them? Thank you for the suggestions for using tiny scraps. I have been wanting to make some mug cushions and now I have those scraps and can do it in a jiffy. I didn’t even think to use them before your suggestion. Hi Amy, I watched (only) the BOM for 2012 bc was I was finishing my doctoral degree and only had time to view (a reward for me) and not time to sew. 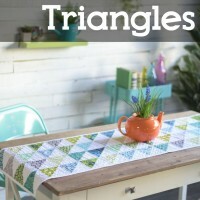 I want to revisit the series but couldn’t find it on Craftsy. Is it available somewhere else? Thanks for your help. Did the quilt block of the month class you taught in 2012. Turned out great. Started the 2013 but haven’t found time to finish. Laura is good but I liked your sampler ideas better. A big thank you for your Craftsy class. I have been trying to get into quilting for ages now. There are no classes near me and I was struggling on my own. Your classes are so clearly explained that I have been inspired to have a go. I have cut out my first block and am about to start to sew. Thank you for sharing your talent with us. Just wanted to thank you for this class, I only took it now (in 2014). I have never quilted before but am a keen sewist (so have plenty scraps), if anything I’ve been a bit scared of quilting. After taking your class however, I realize there’s a whole new world of sewing out there that I didn’t even know about, I can see a new hobby and it’s so exciting to be able to produce these beautiful items out of scraps! I particularly enjoy the paper piecing. Amy, I have tried other BOM’s from other Artists and STILL find that you and your teaching methods are the easiest and clearest to follow. KEEP UP THE GOOD WORK. I totally agree. This old brain needs your (Amy) patient and clear instructions. Hi Amy, I just came to your blog to say I made my first block! I signed up for the course when it first came out, but didn’t really have the time. My youngest was the age of your twins now back then, and it was tricky to find the time in the day and the energy at night. But finally, 3 years on, I pulled out a bag of scraps and made the wonky 5-sided log cabin! Whooo! Go me! I hope to make a set of them and make placemats. I just wanted to thank you for your great instructions. Your casual style and bright and cheery manner made it a pleasure to follow you. Good luck with the twin hurricanes of fun and destruction! I took this class December of 2013 while recovering from foot surgery. I used all types of colors that I never use and it came out great. My Siamese cat is very fond of it as well. Hi Amy, So glad that you’ve chosen a better way for you to home school your children. That must be quite a feat. 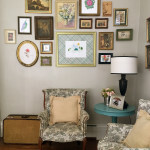 Wanted you to know that I finally posted the 2012 BOM with Craftsy on the project platform. It’s been finished for a while but other things get in the way and I forgot. I learned so much from you on the project and with Leah Day helping us with the quilting it was a great team. Good Luck with this year in all that you do. Hi Amy!! I’m following you from the Craftsy 2012 BOM class when you were pregnant with the twins. I have thoroughly enjoyed the Craftsy class and have also started watching Leah Day on You Tube. I was concerned you weren’t keeping up with your website because so many of the posts are from 2012-13. I sure hope that’s not true. There are a lot of 2015 posts from your followers!! You’re fabulous, Amy! A few years ago I stumbled upon your BOM at Craftsy after I decided to start sewing and quilting. You’re so inspiring; I learned so much from you. I appreciate that you share your talent with all of us. I did the Block of the Month class in 2012 and just loved it. Didn’t gt the last two blocks done so I never got the quilt finished. But, I found the class again and love the blocks so it is my goal to finish what I started and keep going. 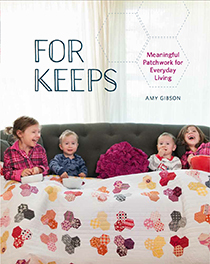 Just love your sweet family and that your life with quilting is real life. 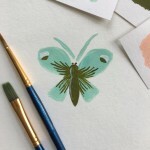 Looking forward to following your blog and your lessons and tutorials. I am trying really hard to sign up for your 2013 Bom club, having been absolutely impressed with last year’s classes The problem is that I cannot access PayPal as there is no category for UK. Can you help me to sort this out? I am so disappointed.